Mike Pompeo, CIA director and a former Republican representative from Kansas, served as a cavalry officer patrolling the Iron Curtain before the fall of the Berlin Wall. Dan Coats, director of National Intelligence and a former senator from Indiana, urged President Barack Obama to punish Russia for its annexation of Crimea in March 2014. Coats and several other lawmakers were banned from traveling to Russia after taking this stance. Pompeo, 53, is often described by colleagues as “hawkish.” He criticized Obama’s decision to shut down secret CIA prisons, called “black sites,” and wants the United States’ terrorist prison in Guantanamo Bay to remain open. Pompeo responded to his nomination by saying that it was a difficult decision to leave his seat in Congress, representing Kansas. “Ultimately the opportunity to lead the world’s finest intelligence warriors, who labor tirelessly to keep this nation and Kansas safe, is a call to service I cannot ignore,” Pompeo said. Coats said that he takes seriously the responsibility of being a leader of the intelligence community. “A robust and responsible intelligence infrastructure is essential to our homeland security, and if confirmed I will ensure our national security decision-makers have every piece of information they need to protect the American people from the threats facing our nation,” Coats said. This comes at a time when the future of DNI’s ICITE (IC IT Enterprise) and Common Desktop Environment is in question. While advocating for collaboration across the intelligence community, ICITE and CDE have come under criticism for moving too slowly. What will happen to these programs under these new leaders? 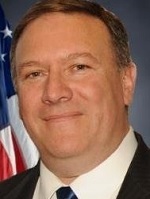 While Pompeo was elated by WikiLeaks’ release of information on Democratic nominee Hillary Clinton’s trove of emails during the 2016 presidential election, he recently called WikiLeaks’ founder, Julian Assange, a “narcissist” and a “fraud” for focusing on the United States while seeking support from antidemocratic countries. Instead of publicly admonishing a group that may have collaborated with Russia to undermine the presidential election, Coats quietly released a report to Congress on May 12 that said that high-level Russian officials interfered with the election. This report follows Trump’s firing May 9 of FBI Director James Comey, who was leading an investigation into the Trump campaign’s possible collusion with Russian officials. However, the White House has released conflicting statements about Comey’s firing, saying it may have been about Comey’s handling of the investigation into Clinton’s emails. If these two men set the stage for the roles of the CIA and the DNI under the Trump administration, then the CIA would be vocal and aggressive, while the DNI would be quiet and merciful. Although Pompeo’s outgoing personality more closely aligns with Trump’s, Coats has set the standard for his ODNI, working diligently on cybersecurity and other intelligence issues. It seems that under the Trump administration, America would experience the yin and yang of intelligence community personalities.